William Bradley : Eora Canoes at Spring Cove, Manly. The Text Publishing Company, Melbourne, Victoria, Australia. 1999. Grove Press, 841 Broadway, New York, NY 10003. 2000, pages 54 to 55. Went over to Shell Cove and left this branch, taking it as reported by those who examined it when the boats first came into this harbour. As we left this branch we met several canoes with one man in each of them; they had so much confidence in us as to come close alongside our boats. After fixing the place of the rock and extent of the shoalwater round it we went into the north arm. As we were going in to the first cove on the east side called Spring Cove, we were joined by three canoes with one man in each. They hauled their canoes up and met us on the beach leaving their spears in the canoes. We were soon joined by a dozen of these and found three amongst them with trinkets &c. hanging about them that had been given to them a week before by the governor on his first visit to this place. Our people and these mixed together and were quite sociable, dancing and otherwise amusing them. One of our people combed their hair with which they were much pleased; several women appeared at a distance, but we could not prevail on the men to bring them near us. We had here an opportunity of examining their canoes and weapons: the canoe is made of the bark taken off a large tree of the length they want to make the canoe, which is gathered up at each end and secured by a lashing of strong vine which runs amongst the underbrush. One was secured by a small line. They fix spreaders in the inside; the paddles are about two feet long, in shape like a pudding stirrer; these they use one in each hand and go along very fast sitting with their legs under them and their bodies erect and although they do not use outriggers I have seen them paddle through a large surf without over-setting or taking in more water than if rowing in smooth water. From their construction they are apt to leak when any weight is in them; the man nearest that point of the canoe, where the water lies, heaves it out behind him with a piece of wood in the hollow of his hand, still keeping his body erect as when rowing. They are by far the worst canoes I ever saw or heard of. I have seen some so small as eight feet long and others twice that length. In these canoes they will stand up to strike fish, at which they seem expert. 1. Introduction to William Bradley : "The Ladies Kept Their Distance ", page 53. Surveying the harbour, William Bradley, first lieutenant on the Sirius, had some rare opportunities to observe the Aborigines as they lived before European contact altered their ways. Perhaps with tales of the maidens of Tahiti in mind, he seems to have been particularly interested in the Eora women, who alas were too well chaperoned for the liking of the young sailor. 2. Notes on Sources, page 337. A naval officer, Bradley assisted with the surveying of Port Jackson, Broken Bay and Norfolk Island. Bradley's journal is in the State Library of New South Wales. The Trustees of the Public Library of New South Wales in association with Ure Smith Pty Ltd, Sydney, 1969. 3. Notes on Illustrations, page 348. "A Voyage to New South Wales: The Journal of Lieutenant William Bradley RN of HMS Sirius 1786-1792. " Courtesy of the Image Library, State Library of New South Wales. 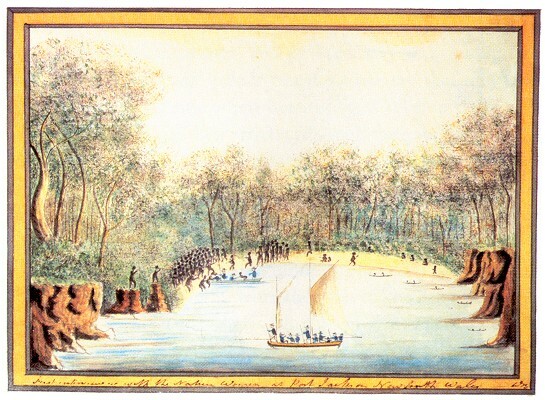 His painting depicts a meeting between the Eora and his exploring party in Spring Cove on 30 January.1788: the first contact between two peoples separated for over 60,000 years. 1. The sealing of the ends of the bark canoe is rudimentary : "secured by a lashing of strong vine". This was possibly the major source of the reported "apt to leak". 2. The "paddles" are one handed blades with none of the mechanical advantage of an oar. 3. The crew kneel in the canoe... " sitting with their legs under them ". 4. Bradley's observation that " they do not use outriggers" indicates some knowledge of Polynesian canoes, perhaps somewhat more than his knowledge of " the maidens of Tahiti" (as noted by Flannery). 5. Although William Bradley's conclusion, " the worst canoes I ever saw or heard of ", appears to be vindicated by the basic construction, the proficiency and familiarity demonstrates a high degree of skill. 5.1 They " go along very fast "
5.2 " In these canoes they will stand up to strike fish,"
5.3 Not reported here, but noted by Curby, page 13 and illustrated above, is the carrying of fire in the craft..
" paddle through a large surf without over-setting or taking in more water than if rowing in smooth water." which they did with ease altho' a very great surf was running". - noted by Curby : History of Manly, page 13. This definitely refers to landing on the open surf beach, now known as Manly Beach. 6. Whatever the structural deficiencies of the craft, the design (as illustrated c.1790) features a substantially curved bow and stern that would be advantageous to negotiate surf conditions. 7. William Bradley's account of canoe use demonstrates that the Eora had a remarkable level of skill in piloting these basic craft in surf conditions. Without further explicit description, surfing experience would indicate that the canoes returned to the beach with the assistance of the waves. Although there is no evidence that riding waves was explicitly sought as amusement (as related by Cook in Taihiti, circa 1770? ), this could be described as surfing, in a basic sense. Finney and Houston note similar examples in Africa and Peru, page 26. "Watkin Tench's journals record him seeing two Aboriginal women bodysurfing on bark from Milson’s Point to Bennelong Point." Barani - Indegenous History of Sydney City. I spoke to a Bundjalung elder named Lawrence Wilson of Coraki and Evans Head and he knows of stories of his people as far away as Casino coming to the beach and body surfing and riding the waves on flotsam during tribal gatherings. Port Jackson Painter's depiction of Aboriginal Weapons and impliments, c. 1790. Copyright : The Natural History Museum, London. re : Barani - Indegenous History of Sydney City. I am researching surf-riding history and was recently directed to this as a possible report of early aboriginal surf-riding. An internet search found Watkin Tench's published works online at the Adelaide University. The documents have a great deal of information relating to aborigines, however on first reading I could not locate the quotation there and I assume that it possibly comes from his unpublished journals. Is it possible to confirm this? At this stage, without access to the original document, I am inclined to think the account maybe somewhat misleading in the terminology. In discussing Australia, Tench often refers to Cook's published accounts (that included the first report of surf-riding in Hawaii) and may have taken the 'bodysurfing on bark' concept from there. More realistically, from "Milson’s Point to Bennelong Point" is basically the span of the Sydney Harbour Bridge which could not be described as a surfing location, the activity does not appear to incorporate what is commonly understood as wave-riding. I take it that Tench's meaning is 'paddling a slab of bark from Milson’s Point to Bennelong Point', and not an easy feat. Rendered into HTML on Mon Nov 3 09:50:03 2003, by Steve Thomas for The University of Adelaide Library Electronic Texts Collection. "She excelled in beauty all their females I ever saw. Her age about eighteen, the firmness, the symmetry and the luxuriancy of her bosom might have tempted painting to copy its charms."